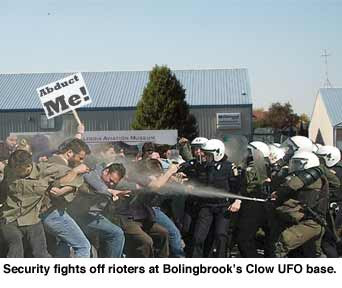 Hundreds of Chicagoland residents rioted at Clow UFO Base in Bolingbrook, IL last Friday as they sought to escape the global economic crisis. Clow security officers used tear gas, sonic suppression, and area-affect Tasers to disperse the rioters. Two hundred rioters were treated for minor injuries, 12 were hospitalized, and 100 were arrested and charged with violating The Bolingbrook Riot Ordinance of 1968. The initial gathering at Clow started peacefully as people congregated at Clow Civilian's Airport wing, and tried to find the entrance to the UFO Base. Many, like Gabriele Rushman, simply wanted to escape a possible global depression. "I used to listen to my great-grandfather's stories about the depression. How he had to hunt for food because his family was so poor. How he had to wear the same clothes for weeks, and how he had to fight to protect what few personal items he had. (Expletive Deleted) that! I'd rather take my chances in an alien slave camp than suffer through what he went through!" Loretta Cummings, 59, said she had no choice but to leave the Earth. "My 401K is gone!" She cried. "And the jobs I can get on Earth won't pay enough to replace the money I lost. So I'm hoping to go to an alien world where I can make a fortune as a housekeeper. I heard that there are places in the Universe where one unit of the local currency is worth $1 million!" Some people had other reasons for wanting to flee the Earth. "I'm not a racist." Said Ben Gould, 22 of Downers Grove, "But there's no way I can live in a country with a black man as President! I'm getting out of here before I become an oppressed minority!" "The signs are clear!" Said Mary Rodriguez. "First Bill Maher releases a movie saying that religious people are going to blow up the world. Then The Bad Astronomer publishes a book called 'Death from the Skies!' It's clear to me that the radical atheists are going to start a nuclear war, and then blame Christians for it! I want to escape the Earth, wait for the war to end, and then come back and wait for the real rapture!" Around 6:30 PM, a previously hidden door opened and security forces marched out towards the crowd. Seconds after the crowd was asked to leave, several people charged the door. "We had no choice but to disperse the rioters." Said Officer 27. No deaths were reported, but many said Clow Security's tactics humiliated them. "All I wanted to do was start a new life." Said an anonymous rioter. "So why did they fire some kind of sound gun at me? It hurt my ears and made me poop in my pants!" Bolingbrook Mayor Roger Claar told The Babbler he gave the order to use force against the rioters. "If you think I'm going let the suburban tax base simply fly away, then you're crazy!" • Ten University of Chicago students from the Milton Friedman School of Economics attempted to set themselves on fire in protest of government policy. "The Republican Party is nationalizing the banks! When even the Republican Party refutes Friedman's ideas, there's no point in living." Said one of the students. Campus security prevented the students from performing the horrific act, and arrested two members of the UC Socialist Student Union who tried to give matches to protesters. • The Village of Bolingbrook Board announced their plans to buy all local businesses. The move is designed to avoid massive closings in the village. Mayor Claar promises that the Village will get its money back. "I am Bolingbrook, and I'm not going to make a bunch of losing investments! Trust me!" • Naperville is considering an ordinance to ban outdoor soup kitchens. "We have an image to uphold." Said an anonymous member of the City Council.